Instead of lambasting his players for their mistakes (two fumbles and a punt blocked for a safety), he let them drink two beers on the flight home, spoke spiritedly to them about how they would right themselves for the rest of the season, and later that night brought them all downtown to the Elks Club with their families for a turkey dinner. The Old Man could be gruff, awkward, unrelenting, but now he showed another side. In like manner, Peter shows himself in this text to be an excellent coach. Having finished his demanding section on the difficult work of submission, he is keenly aware that his early readers will need encouragement. So in this text he encourages Christians to get on with the difficult work of gracious living. He knows his early readers will need cheering on if they are to battle with the world week after week. To accomplish this goal Peter finds the perfect phrase, the ideal biblical reference, and the precise words needed to stimulate the church toward godly submission. Peter will claim that our ability to continue living graciously rests in a proper understanding of our calling. And our calling, he says, is to be a blessing. Peter huddles the family and introduces his encouraging phrase. Do not repay evil for evil or reviling for reviling, but on the contrary, bless, for to this you were called, that you might obtain a blessing. We are called to bless. Shockingly, the uniqueness of Peter’s thought in this section isn’t that we are called to bless God (1:3) but rather that we are called to bless those who persecute us. We are to bless the ungodly ruler, the unjust employer, the difficult husband. He wants us to bless those who are in authority over us. 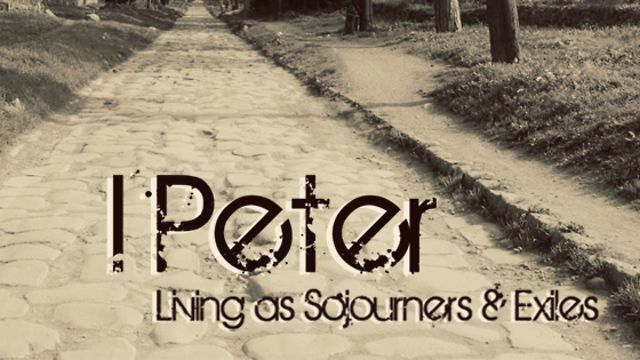 A Christian community, says Peter, is a community that blesses. Thankfully, the text goes on to show that when we live in the world in this way, our actions will be rewarded. The text says we will “obtain a blessing” (v. 9). Isn’t that encouraging? When we bless, we will receive a blessing. Interestingly, that blessing will come at times from God and at other times from man. Certainly verse 9 indicates that it is God who blesses us. Take note then: without blessing others there is no guarantee that any of us can obtain the approval and smile of God. Can there be any higher motivation for us to bless than to obtain a blessing from God? Evidently Peter has not forgotten the day when Jesus taught his disciples about those who are blessed by God (Matthew 5:2–11). But Peter also implies that there may come a time when we receive a blessing from members of the world after some come to faith in Christ. According to 1 Pt. 2:12, on the day when Jesus returns, some will give glory to God. Imagine arriving in Heaven and hearing from those who have been won to Christ through your faithful, submissive service and “Bless you!” Don’t be mistaken: it will be through blessing that the world will be both silenced and saved (see 1 Pt. 2:15 for the first and 1 Pt. 2:12; 3:1 for the second). All of this should encourage us. Be encouraged to bless. It is a matter of calling. When Peter arrives at verse 10, he makes an appeal for encouragement from Psalm 34. This particular Psalm is the ideal reference to encourage Christians to get on with the difficult task of godly living. Whoever desires to love life and see good days, let him keep his tongue from evil and his lips from speaking deceit; let him turn away from evil and do good; let him seek peace and pursue it. For the eyes of the Lord are on the righteous, and his ears are open to their prayer. But the face of the Lord is against those who do evil. "Of David, when he changed his behavior before Abimelech, so that he drove him out, and he went away." What an incredible line. David, the humble follower of the Most High God, submitted himself to God’s timing and continued to bless God (and Saul) in the most difficult times and under the most unfair circumstances. Clearly this is why Peter picks this Psalm to support the point he has been making on submission, suffering, and blessing. This was the real-life situation of a man who gave his life to submission. What an encouragement to Peter’s early readers who were troubled by the call to submit to ungodly rulers and unjust leaders. In David’s obedience, Peter has found one who prefigured Christ in his sufferings. He has found one who emulates the point he has been making. And the church now has proof that God does reward the righteous. So we press on in doing good because we have seen again that God is trustworthy. Not only will God bless us, but we have hope about hearing the words “Blessed be you!” from our enemies. Be encouraged. Two particular words run freely between Psalm 34 and 1 Peter 3. They are the words fear and blessing. The linguistic connection is not only intended by Peter but is meant to encourage his readers to continue in submission. In 1 Peter the Christian is told to have a proper fear of God ( Pt. 1:17; 2:17) without succumbing to an unhealthy fear of human authority (1 Pt. 3:6, 14). Peter’s concern, of course, is to show that a proper fear of God actually results in a proper respect for human authority. Interestingly, the same point was made in Psalm 34. There David uses the term at least five times (Psalm 34:4, 7, 9 [twice], 11). And the emphasis throughout is on proper fear. The one who fears the Lord will be delivered from his own fears. He shall be protected and have no lack. The second word is blessing. This is the very word Peter chose to open his letter with as well: “Blessed be the God and Father of our Lord Jesus Christ!” Was this by accident or coincidence? I don’t think so. This word, bless, is an especially important word for a beleaguered people needing encouragement to press on. Why else would it reappear in Peter’s letter twice within the limits of this very text (1 Pt. 3:9, 14)? Therefore, learn to take it up in practice. Bless God and others. It is the divine key that unlocks our ability to remain steadfast and joyfully submissive. But in your hearts regard Christ the Lord as holy, always being prepared to make a defense to anyone who asks you for a reason for the hope that is in you. … so that … those who revile your good behavior in Christ may be put to shame. God will vindicate us on that day. So leave room for his judgment. Endure. Be encouraged. You have been called to be a blessing. The psalmist has confirmed it. And God’s perfect words will enable you to do it.